Marketplace reports that Volkswagen, which is on a drive to dominate the global car market, aims to double its sales in the United States. But it knows its cars have never really met most of our needs. So, like every contrite husband who's ever had to apologize for neglecting a spouse, VW is vowing to put us first from now on. Browning told the public radio folks, "You know, the German engineering really drives a lot of integrity into our vehicles. But the German engineering focus has also perhaps not always been sensitive to some of the priorities of our U.S. customers." For example, something like cruise control isn't used too frequently in Europe, but is a given on an American car. He says VW gets points off from J.D. Power & Associates if it doesn't have those features. "So, what we're doing is making sure our vehicles are now designed first and foremost with the U.S. customer requirements in mind," Browning says. Disc brakes, though, we couldn't care less about. 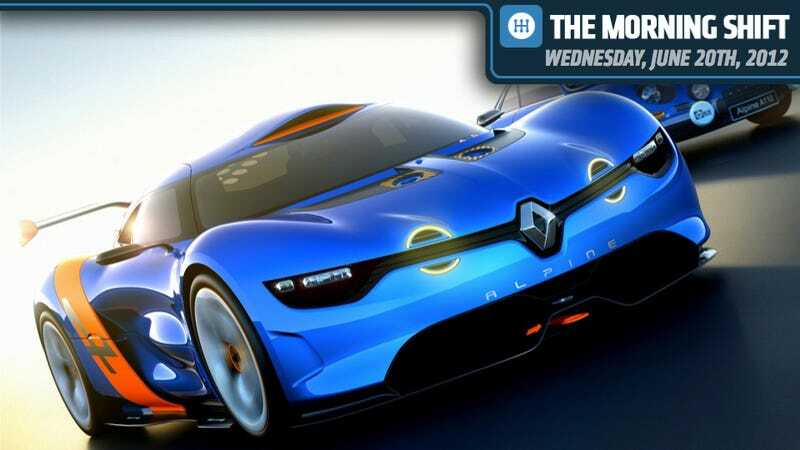 Bloomberg reports that Renault is talking again about bringing back sporty Alpine (remember the Renault Alpine Concept?) and creating another high-end brand as it tries to become a global car company. We've been hearing about the return of the Alpine for at least five years now, but Renault chief operating officer Carlos Tavares puts it in a bigger context than just having a single luxury nameplate. He says Renault would like to offer four brands starting with no-frills Dacia, Renault offering volume cars with more options, Alpine serving as the sports-car make and the Initiale Paris insignia becoming the luxury brand. Without a high-end brand, the most expensive Renault is the Espace minivan, which sells for about $44,000. Adding luxury cars would boost Renault's chances outside Europe, especially in China, one of the world's most competitive luxury market. "We may have one day a luxury brand," Tavares said. "That would help from a profitability standpoint because everybody's always looking at VW and what Audi represents for the VW group." 3rd Gear: Can You See Yourself In An Audi S1? Speaking of Audi, Autoblog brings us this spyshot of what might be the Audi S1. It says Audi engineers are believed to be at work on a more potent version of the Audi A1. Photographers report that this is a gasoline powered car, meaning a 2.0-liter turbo-charged 4 cylinder engine is probably under the hood. Autoblog says it's unclear whether this machine will slot under the limited-edition 256-horsepower A1 Quattro or be sold as a less extreme version. Mlive reports General Motors has gotten back to retirees who are upset at its proposal to give them lump sum payments for their retirement plans, rather than send out monthly checks. GM's Cindy Brinkley, vice president of global human resources, thinks the idea is a win-win for retirees and for the company. But she agreed that "change can be unsettling" and says GM is trying to educate retirees through 75 group meetings, a dedicated call center, information available online, and more. It isn't clear whether that's going to calm any retirees down, though. As we've seen over the years when GM retirees lose something they thought they'd earned, they get pretty touchy about it. The Detroit Free Press says Transportation Secretary Ray LaHood told Detroit leaders they won't be getting a $25 million grant to spend on light rail transportation. The M-1 rail group, which is led by Roger Penske, wants the money for a $137 million project to build a streetcar line along Woodward from downtown to the New Center area. LaHood says there has to be a "credible plan" that outlines how the project would be paid for, implying that the 1,200-page document the group submitted wasn't good enough. Okay, let's see a show of hands: who thinks we'll ever see any kind of light rail, streetcars or rapid transit buses on Woodward Avenue in our lifetimes? As somebody who loves streetcars and rides them whenever she gets a chance, I think it's a shame that there can't be something done. On the other hand, once these projects get started, the costs start to soar, and when the federal government is telling you that your plan is flawed, it's probably pretty flawed. Forbes reports that Fresno once again is the country's capital when it comes to stolen cars. In fact, there are seven California cities on Forbes' top-10 stolen car list. Why is that? California has a lot of people, it has big cities, and it's close to Mexico, where stolen cars often wind up. The safest place for your car, Forbes says, is State College, Pa., and you won't have much trouble in upstate New York, either. On this day in history in 1941, Ford became the last of Detroit's major auto companies to sign a contract with the United Auto Workers union. The move came four years after the nasty Battle of The Overpass, in which Ford's security goons beat up UAW members, including Walter Reuther, for attempting to hand out leaflets at the Rouge Plant. Even though GM and Chrysler had already agreed to UAW demands, the animosity continued at Ford. In April, 1941, workers walked off the job to protest firings at the Rouge. Although Henry Ford once vowed he'd close his factories rather than recognize the UAW, he finally gave in. Legend has it his wife, Clara Ford, pleaded with her husband to stop the violence and threatened to leave him if he didn't reach a deal.